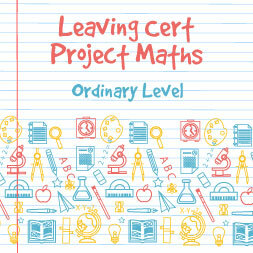 Revise for your leaving cert on the project maths ordinary level syllabus. This course is for students interested in studying the Project Maths Ordinary Level Course in its entirety. This course provides students with videos on all the Ordinary Level topics in one location listed by module and topic. In addition, a comprehensive assessment is provided which tests learners on the entire content of the Project Maths Ordinary Level Syllabus. These topics include Probability and Statistics, Geometry and Trigonometry, Numbers and Shapes, Algebra, Functions and Calculus. Having completed this course, students will be able to: - Describe the concepts of probability; - Understand outcomes of random processes; - Describe statistical reasoning with an aim to becoming a statistically aware consumer; - Find, collect and organise data; - Represent data graphically and numerically; - Analyse, interpret and draw inferences from data; - Develop synthesis and problem-solving skills; - Determine the slope of a line passing through two given points; - Find the equation of a line passing through two given points; - Find the equation of a line perpendicular to a given line and passing through a given point; - Determine the equation of a circle having a given centre and radius; - Find the equation of a tangent to a given circle at a specified point; - Find distance and angle using Sine and Cosine Rules; - Find length of an arc and area of a sector using circular measure; - Determine the area of a triangle given the lengths of two sides and the included angle; - Determine the sum of an arithmetic series; - Determine the sum of a geometric series; - Work out the profit made on a sale; - Work out the income tax paid on the gross pay; - Multiply and divide complex numbers; - Work out the areas and volumes of well known shapes and solids; - Solve linear simultaneous equations with 2 unknowns; - Factorise expressions of order 2; - Form quadratic equations with given roots; - Solve one linear equation and one equation of order 2 with two unknowns; - Solve basic inequalities; - Interpret the solutions of simple simultaneous equations; - Basic Differentiation of functions; - The rules of differentiation (product rule, quotient rule, chain rule); - Determine the local maxima and local minima turning points of a curve; - Understand rate of change of distance; - Use slope to determine the nature of a function; - How to use the Trapezoidal Rule to find area.